My baby seems to have mouth ulcer, what do I do? There is a boil in my child’s mouth, should I rush her to the doctor? Are these questions bothering you? 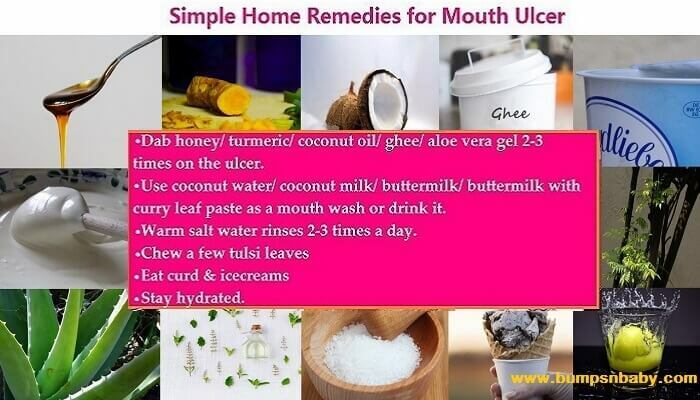 Today I bring to you the home remedies for mouth ulcer in babies and kids which are really effective. When it comes to your baby, even the slightest thing can result in sleepless nights. For your little munchkin it could be something really small that is irritating her, for you seeing your little one in distress can make you worry and lose sleep. But once you know the root cause, there are quite a few things you can handle on your own, without rushing to your pediatrician. Mommies, one of the issues you can tackle at home are mouth ulcers in babies, toddlers and kids. Today we will be looking at some tried and tested home remedies to deal with these pesky ulcers. Mouth ulcers or canker sores are sores that are formed inside the mouth. They are generally white with redness around it. It is not contagious and can be treated at home. Stress – yes your little one can get stressed out during times of illnesses. Injury – This can happen due to brushing or biting insides of the cheeks. Deficiencies – Deficiency of Vitamin B, iron or zinc can cause mouth ulcers. Body heat – This happened to be my granny’s diagnosis every time I had one of these. Food allergies – This can also trigger ulcers in the mouth. The signs and symptoms of mouth ulcer in babies, toddlers and kids are as follows. Pain – Mouth ulcers are really painful, more so for little ones. Irritation – If your child seems irritated; make sure you check his mouth for ulcers. Refusal to eat – Eating becomes painful due to the ulcer and feeding them can be painful for you too. If your little one has a mouth ulcer, you can help relieve the pain with the help of these remedies. Unfortunately mouth ulcers can take up to 14 days or at times more to clear up. A really long time for something seemingly small right? 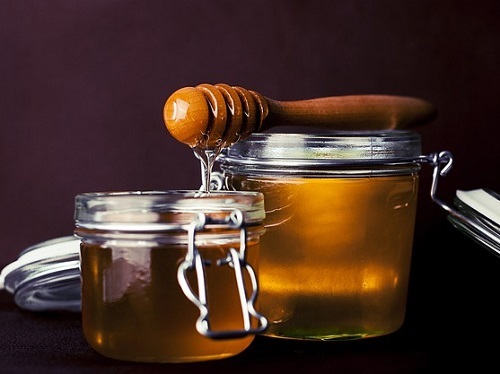 Honey has anti-microbial properties, so it helps to heal the ulcer faster. All you have to do is apply a bit of honey on the ulcer. The best part is that it tastes good too, so kids won’t object. But unfortunately, honey shouldn’t be used for kids under 1. You can read why honey shouldn’t be given to babies below 1 year. You know how your mom would reach out for the turmeric if she ever cut herself in the kitchen? 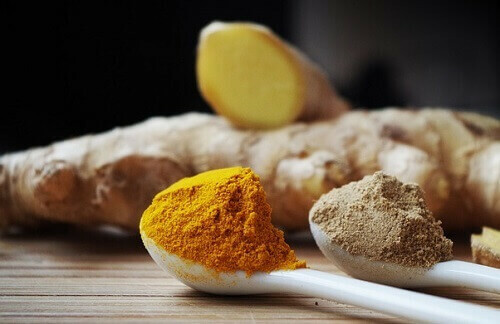 Turmeric has anti-inflammatory, antiseptic, antibacterial properties that expedites the process of healing. A paste of turmeric and honey can not only help relieve the pain but only help the ulcer heal faster. Just like moms, this one is quite a multi tasker. Why so? You can use various forms of this to help deal with mouth ulcers. Oil, water or milk – all three can be used in the treatment of mouth ulcers at home. Give coconut water to your baby or kids. 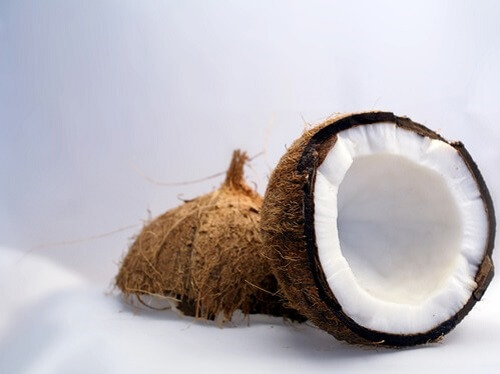 The coconut milk when gargled gives immense results in soothing the mouth ulcers in older kids. In toddlers the coconut oil can be dabbed on the ulcer. Virgin coconut oil is proven to be the best remedy for mouth ulcers in babies above 6 months. However moderation is the key. 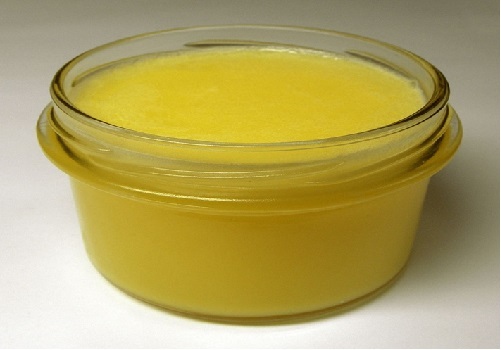 Ghee can be dabbed directly onto the sore for relief and to enable healing. Most kids like the taste of clarified butter so applying it won’t be much of an issue. Buttermilk contains lactic acid, which help to curb bacterial growth and activity. So use buttermilk as a mouth wash.
You can also give buttermilk to drink on a daily basis to babies above 8 months and toddlers. Having curd is said to relieve the symptoms because like buttermilk, even curd contains lactic acid. 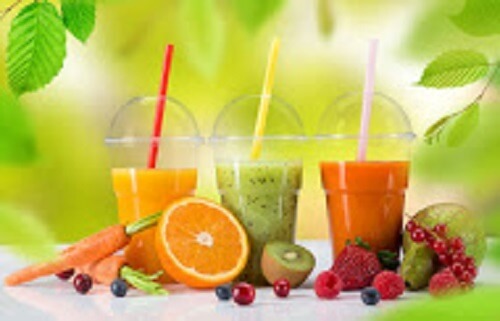 If your child doesn’t like to eat curd, you can prepare some yummy fruit smoothies by adding curd and honey. A paste made from a few curry leaves when mixed with buttermilk also known as ‘sambaram’ becomes a tasty and effective treatment for cold sores. You can ask your kid to drink it or use as a mouth wash.
Curry leaves are anti-inflammatory and antimicrobial. It also contain a lot of vitamins like Vitamin A, Vitamin B, Vitamin C and Vitamin C. So if your child has developed an ulcer due to a vitamin deficiency, then make sure to add curry leaves to his diet. You can also make a powder of roasted curry leaves with coconut and salt. Give it to your kids along with ghee in his rice. 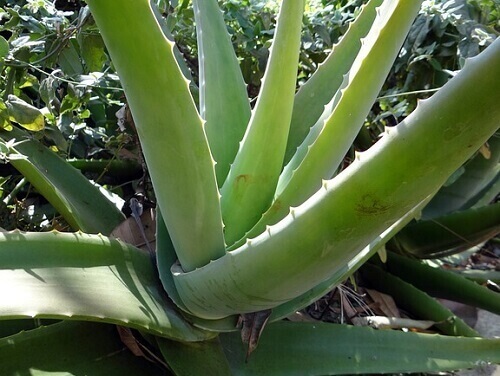 The miracle plant aloe vera is also really good to treat mouth ulcers. You can use the gel like secretion from the plant directly onto the ulcer. Don’t worry about the rest of the gel, you can apply it on your face or hair too as this plant has a host of beauty and health benefits. 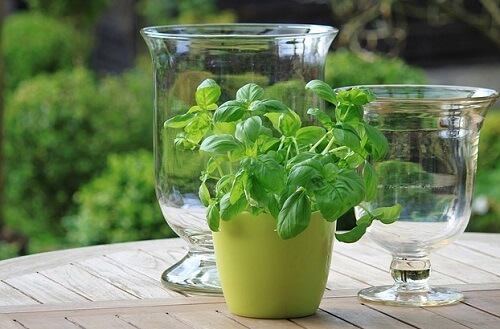 Chewing basil leaves acts a great home remedy for ulcers. You can give 2 to 3 leaves to your child to chew on. Tulsi or Holy basil is also known to treat other issues in children like cough, cold, fever etc. 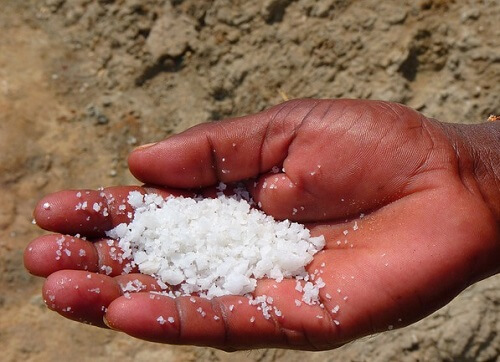 You know this combo – warm water with salt rinse works wonders for a sore throat. It works here too. You can do this for older kids who can give a good swirl and spit it out. 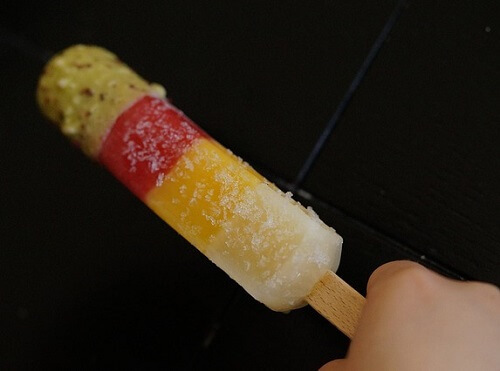 An ulcer can be quite painful for a kid, so to make the healing process fun for your little munchkin you can give them ice lollies (made at home preferably). The cold treat will help numb the area and relieve the pain. 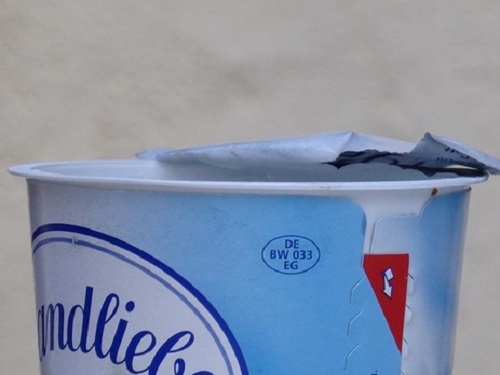 Here’s how you can make a simple ice lolly. Puree deseeded watermelon and pour into ice trays. 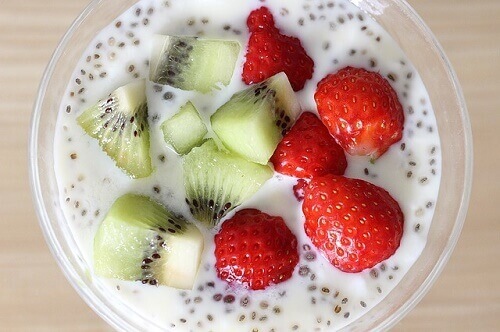 Keep in the deep freezer for 5 minutes. Once the lolly is about to be solidified, insert wooden toothpicks into each of the ice cubes. Deep freeze for another 1 to 2 hours. We don’t need the candy, but the root of the liquorice plant. It is called Yashtimadhu/ Muletthi/ Irattimadhuram / Jeshtimadh. Soak a liquorice root (around a inch big) in some water and bring it to a boil. Switch of the stove and let it steep. Once the water has cooled, you can ask your child to gargle. This needs to be done 4-5 times a day. You can also make a paste of liquorice powder with honey and apply it directly on the wound. Your child might be experiencing difficulty in eating or drinking because of the ulcer, but it is important that the child drinks plenty of fluids and stays hydrated. Dehydration can lead to the insides of the mouth to dry up which will worsen the ulcer. For babies, do breastfeed as it helps with hydration and healing mouth sores. For babies above 6 months, try giving semi-solid or liquid food to your child so they experience the least amount of discomfort. Apart from these home remedies, also do keep these points in mind. If the ulcer doesn’t subside even after a week or two or your child seems to be getting it too often talk to his doctor. Mouth ulcers that look infected with pus also need to be checked by a doctor. If the ulcer is accompanied by high fevers also require the attention of a doctor. Ulcers outside the mouth could be a cold sore and is contagious. Get him checked by his paediatrician if you see a sore outside his mouth. Hope this article on home remedies for mouth ulcer in babies and toddlers was helpful. Mommies, do you have any tried and tested home remedies for mouth ulcer in babies? Do share with me in the comments. Next Article Birthmarks in Babies – The Greatest Myths Busted! My 4.5,yr old having a round boil inside her lower lip but no pain.. Applying ghee butter etc can blisters not be painful? the ice lollies idea is fantastic! where we can get the virgin coconut oil in Abu Dhabi, please advise. Baking soda is an alkaline agent and helps neutralize acids, I’ve had sores a few times and I’ve applied baking soda directly on the sore, you don’t need a lot just a dab every night, you can also rinse mouth with baking soda and warm filtered water. However, applying baking soda directly on the sore seems to be more effective. Hope this helps anyone needing help. Do you have any suggestions … I would really appreciate it. Thank you. My baby is two months and has sores near the back of her mouth. I noticed some of the remedies here would probably be contra indicated given her age. I know baking soda works so I’ve diluted some with filtered water and I’m hoping this will help. Vijay, apply extra virgin coconut oil on the sores every night before he sleeps. This will surely help. Make sure he gargles with buttermilk often. Hey… My two and a half year old had got quite a big canker sore on his tongue day before yesterday…I was really worried as he couldn’t eat anything and was in so much pain… Since coconut oil had worked really well for me, I started applying it to him every hour or so on the first day.. Second day the pain had probably reduced a great deal as he started eating normal Alhamdulillah though the sore had gotten bigger and whiter… i continued to apply the coconut oil about 4-5 times dat day.. Today’s the third day and the sore has come to the colour of the tongue and the pain has almost vanished… jus applied it one time …. I’m so so relieved coz I was terrified as to when it would go away .. I strongly suggest you to try coconut oil.. and yes the raw organic pure one… Not the bottled junk..
Glad to hear that your child is fine. As for coconut oil – it is really a miraculous ingredient. It can cure almost everything! Hello! I’m desperate for any answers and help! I came across this website and article and your comment in hopes you can reply to me. For starters, my daughter is two years old, and and several sores on her tongue, I’m desperate for any remedies to help soothe the pain she is going through. It has been 3 days already and I’m going crazy trying everything I read on the internet, but she is still having a hard time eating and drinking and the sores are still there! Reading your comment makes me want to use coconut oil, but I’m curious to how I would even apply it! Please help! I hav gone through ur home remedies hope it realy works for my baby TNX. Hey, such an excellent article. I usually prefer to give natural & homemade medicines to my daughter instead of allopathic.These are safe & has no side effect. Thanks for sharing.